We are revisiting our 50 most-watched videos from the London 2012 Olympics. All the great moments are in the countdown, from Jessica Ennis, Greg Rutherford and Mo Farah winning golds in a 45-minute spell on Super Saturday, to Chad le Clos's father Bert paying an emotional tribute to his "beautiful boy" who won gold in the pool, and Sir Chris Hoy claiming an historic sixth Olympic crown. Stephan Feck of Germany splashes out of the men's 3m springboard competition after a calamitous dive in the second preliminary round. His foot appears to slip off the side of the diving board and he enters the water on his back, before being awarded a failed dive. This clip was the most-watched on the BBC Olympic site, attracting 1,049,648 views. BBC Sport takes an offbeat look at some of the funny and unusual moments from London 2012. The hurdling discus champion, the pole vault mishap and Garth Crooks's bizarre football formation with 11 outfield players are all here. Some of the more painful and embarrassing moments athletes will be hoping to forget from London 2012. High-speed spills on the BMX track, blood spilt on the hockey field and a pole vault slip-up. Viewers of a caring, sympathetic nature should look away now. Great Britain's Mo Farah takes his second gold medal of the London 2012 Olympics with a thrilling sprint finish in the 5,000m. He became only seventh man in history to complete a and 5,000m Olympic double at the same Games. Ethiopia's Dejen Gebremeskel took silver and Thomas Longosiwa of Kenya won bronze. BBC basketball commentator Mike Carlson takes his eye off the ball during Argentina's quarter-final victory over Brazil - and pays the price. The incident was not caught on camera, which is a shame, but there's no doubting what happened. Fans voice their disapproval as the women's doubles match between China's Yu Yang and Wang Xiaoli and South Korea's Jung Kyung-eun and Kim Ha-na ends in controversy. Constant errors, including players serving into the net, featured in the match which the Chinese top seeds lost. Both pairs were already through to the quarter-finals and were trying to avoid China's Tian Quing and Zhao Yunlei in the last eight. Jamaica's Usain Bolt setting a new Olympic record in the process. Compatriot Yohan Blake wins silver with a time of 9.75 seconds, while American Justin Gatlin claims bronze in 9.79. BBC One commentators Denise Lewis, Colin Jackson, Michael Johnson and John Inverdale, can hardly contain their excitement as Mo Farah becomes the first Britian to win the 10,000m Olympic gold. Farah is roared on by the spectators and presenters alike as he crosses the line in 27 minutes 30.42 seconds to win the first gold of his historic double. His training partner Galen Rupp of the United States takes silver with Ethiopia's Tariku Bekele in bronze. Cuba's Lazaro Borges is lucky to escape uninjured as his pole shatters during his attempt to clear 5.35m in the men's pole vault competition. Borges went on to clear 5.50m but that was not enough to get him a place in the final. 10. Mo Farah caps off "Super Saturday"
Mo Farah shows the field a clean pair of heels to win the 10,000m to take the first of his gold medals and bring "Super Saturday" - 5 August - to a climax. Minutes earlier, Jessica Ennis and Greg Rutherford had both won gold medals for Britain in the heptathlon and long jump respectively. North Korean Yun Chol Om lifts three times his own bodyweight and sets a new Olympic record in the clean and jerk - with a lift of 168kg. The 20-year-old takes gold in the men's 56kg weightlifting category with an overall total of 293kg. Britain's golden girl Jessica Ennis secures a memorable heptathlon title as she crosses the line first in the 800m. The 26-year-old's total of 6,955 points is a huge 327 clear of world champion Tatyana Chernova in second and 337 better than Lyudmyla Yosypenko in bronze. Epke Zonderland stuns the crowd at the North Greenwich Arena with an electric performance on the horizontal bar to win gold. The 26-year-old Dutchman pulls off the most difficult release combination - a Cassina to Kovacs to Kolman - in a spectacular performance to score 16.533 and claim his first Olympic title. Defending champion Zou Kai of China produces a near-perfect routine with a huge difficulty tariff but can only finish in bronze medal position as Germany's Fabian Hambuchen takes silver. Usain Bolt powers to victory in the 200m final to become the first man to successfully defend both Olympic sprint titles. Bolt, who also retained his 100m crown on Sunday, leads home a Jamaica one-two-three in a time of 19.32 seconds. Yohan Blake takes silver in 19.44, with Warren Weir in third. BBC Sport looks back at 20 of the most memorable moments of London 2012, including Super Saturday, Usain Bolt's stunning triple gold, the dominance of Britain's cyclists and much more. There are 20 clips, each lasting 12 seconds, to commemorate what was a landmark sporting year for Britain. Jamaica's team of Usain Bolt, Yohan Blake, Nesta Carter and Michael Frater win gold in the men's 4x100m relay in a world record time of 36.84 seconds. The United States team, which includes Tyson Gay and Justin Gatlin, takes silver with a national record 37.04, with Trinidad and Tobago (38.12) winning bronze. Bolt receives the baton with Jamaica already in the lead and crosses the line in 36.84 seconds, smashing the previous record of 37.04 and the Olympic record of 37.10. Sir Chris Hoy wins a British record sixth Olympic gold medal. After winning gold on the first night of the track cycling programme in the men's team sprint, Hoy's triumph was the perfect finale for Team GB. The Scotsman holds off Germany's Maximilian Levy in a thrilling finish to capture the keirin. A look back at each of the 29 gold medals won by Great Britain at London 2012. Rowers Heather Stanning and Helen Glover started Great Britain's Olympic goldrush, with boxer Anthony Joshua winning the final gold on the last day of the Games. Team GB finished the London Games with 29 golds, 10 more than the 19 won at the Beijing Olympics, and a remarkable 65 medals in total. A massive pile-up in the first run of heat three of the men's BMX quarter-final results in an easy victory for New Zealand's Marc Willers. A crash on the first banked turn brings down all the riders apart from Willers. Manuel De Vecchi of Italy eventually comes home in second place. Andy Murray produces a fantastic performance to banish the memory of defeat in the Wimbledon final and win gold for Great Britain, beating Roger Federer in straight sets. Murray is aggressive from the start, taking the first two sets for the loss of just three games. Federer, the world number one, is for once unable to respond as Murray wins 10 games in a row on his way to a 6-2 6-1 6-4 victory in under two hours on Centre Court. 22. When Wiggins seals his knighthood? Bradley Wiggins at Hampton Court to make him the most decorated British Olympian. The cyclist, who had become the first Briton to win the Tour de France the previous month, comfortably sets the fastest time around the course, ahead of Germany's Tony Martin and fellow Brit Chris Froome. BBC commentators Steve Cram and Brendan Foster stand to salute Mo Farah's second gold medal in a thrilling 5,000m race. In the studio, pundits Denise Lewis and Colin Jackson jump for joy as the 29-year-old wins Great Britain's 27th gold medal of London 2012. Farah became just the seventh athlete in Olympic history to take gold in the 10,000m and 5,000m. Several triathletes fall foul of slippery conditions on a tight corner near Buckingham Palace during the cycling section of the 2012 Olympic triathlon in central London. Poland's Maria Czesnik, Pamella Oliveira of Brazil and Emma Moffat of Australia are among the riders to crash their bikes on the left-hand corner, effectively ending their chances of winning a medal. Czesnik has the additional indignity of being run over by an opponent. Defending Olympic champion Usain Bolt wins his men's 100m heat with a time of 10.09 seconds to qualify for the semi-finals at the Olympic stadium. Bolt's training partner Yohan Blake is slightly quicker than his fellow Jamaican, winning his heat in 10 seconds flat. American duo Justin Gatlin and Ryan Bailey look in good shape, clocking 9.97 and and 9.88 respectively. After winning his first bout in the men's heavyweight judo, Guam judoka Ricardo Blas Jr, who weighs 34st 5lbs, is beaten by Cuba's Oscar Brayson in the last 16. Blas Jr is more than 10 stone heavier than any other athlete in the Olympics - and 6st 10lbs heavier than the entire Japan women's gymnastics team. Great Britain as they defeat France in the men's team sprint final. Philip Hindes, Jason Kenny and Sir Chris Hoy clock 42.600 seconds, beating the mark they set in the previous round. Victory gives Hoy the fifth Olympic gold medal of his career, matching Sir Steve Redgrave's record in rowing. Fencer Shin A Lam delays the epee competition at the London 2012 Olympics after refusing to leave the arena following defeat in the semi-final. The South Korean broke down in tears following her semi-final loss to German Britta Heidemann - Shin looked to have beaten Heidemann only for the clock to be reset with one second remaining of sudden death, and Heidemann then managed to score a decisive hit for a 6-5 win. Shin reappeared for her bronze-medal match but was beaten 15-11 by China's Yujie Sun. North Korea women's football match against Colombia is delayed as their players refuse to take to the field after their photos are incorrectly shown on the big screen beside the flag of South Korea. The error occurs while the players were warming up and leads to the match being delayed by one hour and five minutes. Locog is obliged to issue an apology to the country's National Olympic Committee. Greg Rutherford becomes the first British man to since Lynn Davies in Tokyo 1964. The Briton's 8.31m effort in the fourth round is enough to push Mitchell Watt of Australia (8.16m) into silver and Will Claye of the United States (8.12m) into bronze. Issaka reportedly took up rowing only three months before London 2012. Niger rower Hammadou Djibo Issaka earns a standing ovation at Eton Dorney the hard way, as he struggles to the finishing line in his men's single sculls repechage. Issaka, who reportedly took up the sport only three months before London 2012, eventually crosses the line to massive applause, a full minute and 39 seconds after Lithuanian winner Mindaugs Griskonis. There were several incidents during the game that angered players of both sides. Tempers fray in the men's basketball quarter-final between Spain and France, which Spain won 66-59 to reach the last four. "It's embarrassing, it's disturbing, and quite frankly it's a detriment to the game," says BBC commentator and former NBA star John Amaechi. Gold-winning Pendleton thanked her supporters after her keirin triumph. It was the first time keirin had been an Olympic discipline for women, and Victoria Pendleton, who retired after London 2012, took the inaugural gold. Pendleton hits the front at the bell and holds off a late charge from China's Guo Shuang. "I can barely believe it right now," admitted Pendleton after the race. "Thank you so much to everyone who's helped me get here. The crowd have been fantastic and it really helped me today." Liu Xiang's Achilles injury also destroyed his medal chances at his home Olympics of Beijing 2008. China's former Olympic champion and world record holder Liu Xiang is eliminated from the 110m hurdles after clattering into the first hurdle in his heat. The 2004 champion Xiang, whose hopes of home success at Beijing 2008 were also ruined by injury, leaves the arena in a wheelchair. "When you've got a stress injury like an Achilles and it fails on you it can cause you hell. That's a massive shame for him," says BBC Sport pundit Colin Jackson in commentary. A bottle thrown from the crowd lands on the 100m track just as the final starts. Jamaica's Usain Bolt triumphed in the men's Olympic 100m final, but a sub-plot involved at man being charged with a public order offence. Ashley Gill-Webb, 34, of South Milford, North Yorkshire, is arrested at the Olympic Stadium after allegedly throwing a plastic bottle in the direction of the athletes as the gun sounded to start the race. He denies the charge. Eyewitness John told BBC Radio 5 live: "As big a cheer went up for this guy getting arrested as for Usain Bolt going over the line." The Le Clos family hail from Durban in South Africa, and had relatives scattered across the arena in London. It became a catchphrase of the Games: "Unbelievable! Unbelievable! What a beautiful boy!" South African swimmer Chad le Clos beat veteran multi-Olympic champion Michael Phelps to record a stunning win in the 200m butterfly at London 2012. Two knights collide as, after winning his sixth Olympic gold medal and becoming the most successful British Olympian of all time, Sir Chris Hoy is surprised trackside by Sir Steve Redgrave. Having won gold on the first night of the track cycling, Hoy's triumph in the keirin took him past Redgrave's record of five Olympic golds. Afterwards, the Scot announced he would not be competing at the next Games in 2016. Pete Waterfield and Tom Daley look downcast at the end of the men's synchronised 10m platform final. "I hope that Pete doesn't blame himself," says British diver Ben Swain in commentary as Tom Daley and Pete Waterfield miss out on a podium place in the 10m synchronised event - a poor fourth dive putting them out of contention. "He might feel guilty... [but] these guys are the best in the world. They are going to the physical limits of what the human body can do." Great Britain's Alistair Brownlee wins his country's first ever triathlon gold as he crosses the finish line in glorious sunshine in London's Hyde Park. Brownlee's gold was Britain's 19th of the 2012 Games, equalling the total number of golds they won in Beijing in 2008. A close shave for Belarus's Vadim Kaptur, who performs an inward-three-and-a-half somersault dive and narrowly avoids hitting his head on the 10m platform. The Belarussian diver suffered a horrible injury performing the same dive at the World Championships in Shanghai in 2011, and his technique still appears treacherous. Commentator Michael Johnson dubs Manteo Mitchell "a great team-mate to have", after Mitchell reveals he ran the last 200m of the Olympic men's 4x400m relay heats with a broken left leg. Mitchell still managed to finish the opening lap in 46.1 seconds as the US team went on to set a qualifying time of two minutes, 58.87 seconds and qualify for the final. Mo Farah poses on the podium alongside Usain Bolt. What better scene was there to cap a thrilling final day of athletics than double Olympic champion Mo Farah doing Usain Bolt's 'lightning bolt' and Bolt, who won his third gold of the Games in the 4x100m relay, repaying the favour by doing the 'Mobot' on the podium? Jessica Ennis lead heptathlon after four events. Jessica Ennis features again in your most watched videos from London 2012. This time it is the highlights of her performances in the 100m hurdles, 200m, shot put and high jump which put her into the heptathlon lead. In one of the iconic moments of London 2012, the woman long anointed as the face of the Games fulfilled her destiny with a series of brilliant personal bests. BBC Sport looks at how Jessica Ennis won the gold medal in the heptathlon. Belinda Snell of Australia battles against French opposition. Belinda Snell sends the crowd into raptures with a late basket to send Australia's Group B battle with France into overtime. The basket tied the game at 65-65 but the French recovered to win 74-70 in added time - the first time since 1996 that Australia lost a team other than the United States at the Olympic Games. Alexis Vastine is furious after he is denied a place in men's welterweight semi-finals. Frenchman Alexis Vastine stages a sit in as he is denied victory and a place in the men's welterweight semi-finals after narrowly losing to Taras Shelestyuk. Vastine was also denied a win in the Beijing semi-final four years earlier. Lawrence Okoye stages a great recovery after his opening throw goes wrong. Lawrence Okoye reaches the discus final after throwing 65.28m with his third effort, a great recovery after an opening throw that went horribly wrong. Okoye roars his approval after progressing, bringing his coach John Hillier to his feet in the stands. Andy Murray speaks of the "biggest win of his life". 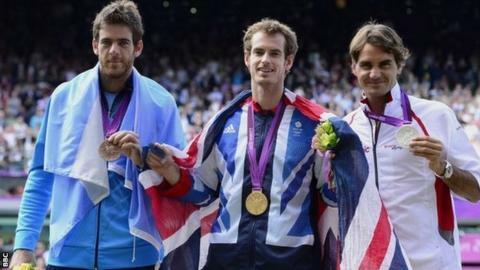 Great Britain's Andy Murray describes taking Olympic gold as the "biggest win of his life" after a straight-sets victory over Roger Federer at Wimbledon. The win was Murray's first over Federer in a major final, having previously lost three Grand Slam deciders to the Swiss. Colin Jackson celebrates with Denise Lewis. What were you doing when Usain Bolt retained his Olympic 100m title on a magical night in London? We can tell you what BBC commentators Colin Jackson and Denise Lewis were doing - screaming in delight as it all unfolded. Bolt clocked an Olympic record time of 9.63 seconds, while his Jamaica team-mate Yohan Blake took silver and Justin Gatlin of the United States winning bronze. Chris Mears reaches semi-finals of the Men's 3m springboard. GB diver Chris Mears progresses to the semi-finals of the Men's 3m springboard competition, but his 17-year-old team-mate Jack Laugher fails to qualify. Laugher was lying in 25th place going into the final dive, however he failed to qualify after recording a failed dive in round six. BBC Sport will continue the countdown on Saturday, with 20-11 of the most-viewed London 2012 videos on the BBC Sport website.